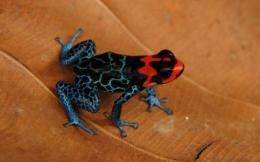 "Ranitomeya amazonica", a frog with an incredible burst of flames on its head, and contrasting water-patterned legs - one of the species announced by WWF in a new report. The frog's main habitat is near the Iquitos area in the region of Loreto, Peru, and is primary lowland moist forest. Spectacular species previously unknown to the outside world are being discovered in the Amazon rainforest at a rate of one every three days, environment group WWF said in a report published Tuesday. An anaconda as long as a limousine, a giant catfish that eats monkeys, a blue fanged spider and poisoned dart frogs are among the 1,220 animals and plants to have been found from 1999 to 2009, according to the study. The report was released on the sidelines of a United Nations summit in Japan that is being held to try to stem the mass extinction of species around the world, and the WWF said it highlighted why protecting the Amazon was so vital. "This report clearly shows the incredible, amazing diversity of life in the Amazon," Francisco Ruiz, head of WWF's Living Amazon Initiative, told reporters at the launch. "(But) this incredible region is under pressure because of the human presence. The landscape is being very quickly transformed." Logging and clearing for agriculture uses such as cattle farming and palm oil plantations have led to 17 percent of the Amazon -- an area twice the size of Spain -- being destroyed over the past 50 years, according to the WWF. The WWF compiled the findings reported by scientists over the 10-year period to highlight the extent of biodiversity loss that may be occurring without humans even knowing while the Amazon is being cleared. "It serves as a reminder of how much we still have to learn about this unique region, and what we could lose if we don't change the way we think about development," Ruiz said. 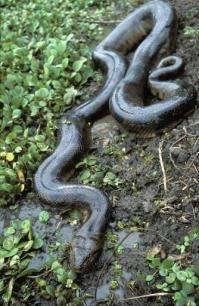 One of the most amazing discoveries was a four-metre (13-foot) anaconda in the flood plains of Bolivia's Pando province in 2002. It was the first new anaconda species identified since 1936, and became only the fourth known type of that reptile, according to the WWF. There were a total of 55 reptile species discovered, with others including two members of Elapidae -- the most venomous snake family in the world that includes cobras and taipans. A kaleidoscope of different coloured frogs were also found, including 24 of the famed poison dart variety and one that was translucent. Among the 257 types of fish discovered in the rivers and lakes of the Amazon was a "goliath" catfish. "Inia boliviensis," pictured in Bolivia. The Amazon River dolphin or pink river dolphin was recorded by science in the 1830s, and given the scientific name of "Inia geoffrensis". In 2006, scientific evidence showed that there is a separate species "Inia boliviensis" of dolphins in Bolivia, although some scientists consider it a subspecies of "Inia geoffrensis." One of them found in Venezuela measured nearly 1.5 metres long and weighed 32 kilogrammes (over 70 pounds). Although the "goliath" catfish normally exists on a diet of other fish, some of them have been caught with parts of monkeys in their stomachs, according to the WWF. Another extraordinary species of catfish that was discovered in the Brazilian state of Rondonia was extremely small, blind and red. Villagers found the fish when they accidentally trapped them in buckets after hauling up water from a well. At least 500 spiders were also discovered, including one that was completely brown except for a pair of almost fluorescent blue fangs. Thirty-nine new mammals were also found, including a pink river dolphin, seven types of monkey and two porcupines. Among the 637 new plant species discovered were sunflowers, ivy, lilies, a variety of pineapple and a custard apple. The first new anaconda species identified since 1936, the "Eunectes beniensis", from Bolivia's northeastern Amazon province and then found also in the floodplains of Bolivia's Pando province - just one of the new species highlighted in a new WWF report. The Amazon is home to at least 40,000 plant species, and the WWF described the scale of diversity in some areas as "mind boggling". It said 1,000 plant species were documented in one hectare (2.5 acres) of lowland rainforest in Ecuador, while 3,000 were found in a 24-hectare region of the Colombian section of the Amazon. As part of efforts to save the Amazon, the Brazilian government has worked with the WWF, the World Bank and other groups to establish protected areas of rainforest covering 32 million hectares over the past six years. The WWF said the protection efforts, in which foreign governments and organisations provide some of the finance to help run the projects, should serve as a model for the world in how to save rainforests. Just my prejudice showing, but do we really need another giant snake? What else is going to eat the giant spiders and other bugs we haven't found yet? the moment we find a new species, the moment it gets promoted to the list of endangered species. sometimes it's better not to find new species. let them be and let them live in peace. they have done pretty well without us " trying to save them ".